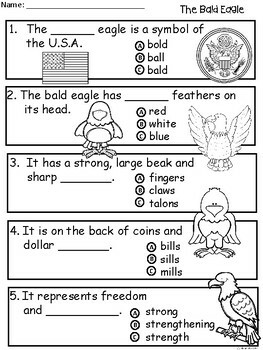 I made these easy printables of the Bald Eagle for my students to practice for an upcoming multiple choice question/answer type test at the end of the school year. I want them to feel confident when that time comes. There are 3 different versions for differentiated instruction. 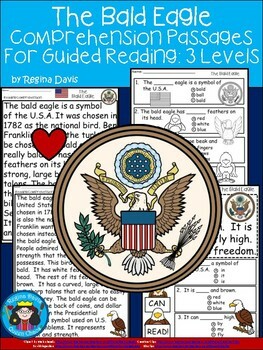 This set is made to use whenever you're studying about U.S.A. symbols in Social Studies. 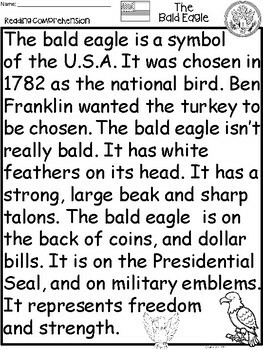 I like to use this in February around Presidents' Day. The mid-level and the advanced sheets use the same question/answer sheet. Either copy the question/answer sheet onto the back of the best reading sheet for your students, or just copy it separately so that students can look at the reading passage and the multiple choice answers at once. I specifically used larger print to help my students feel more comfortable reading the passages. I have given you the option of printing in either color or black and white. Please view the mini windows as the entire download can be seen there. 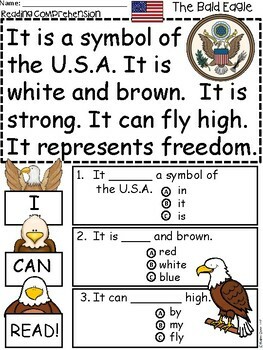 The only addition are the same sheets in black and white or color as well as the answer sheets.